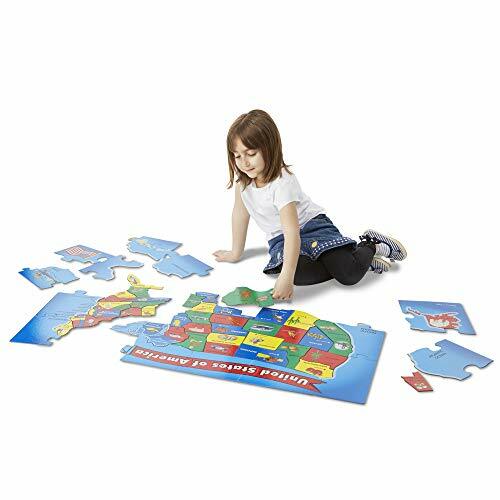 EASY-TO-ASSEMBLE USA FLOOR PUZZLE: The Melissa & Doug USA Map Floor Puzzle is a 51-piece, easy-to-assemble floor puzzle. 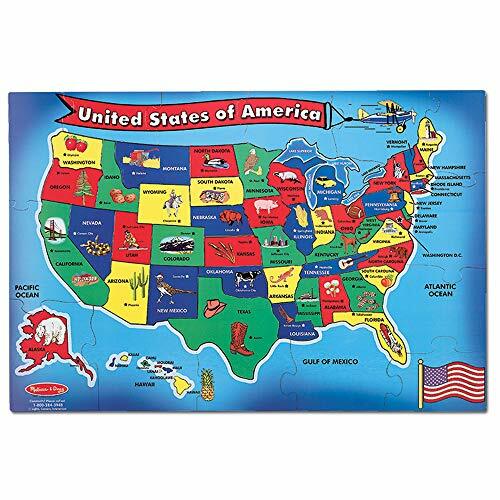 This cardboard jigsaw puzzle has individualized pieces with brightly colored features distinct to each state. EASY TO CLEAN: Each piece of this USA Map Floor Puzzle is coated with an easy-to-clean surface to keep the puzzle looking new, allowing for simple cleanup of accidental spills and dirt. EXCEPTIONAL DETAIL: All 51 pieces have customized details, including the state name and capital, with most states including a primary industry or hallmark of the state-such as the Statue of Liberty for New York. 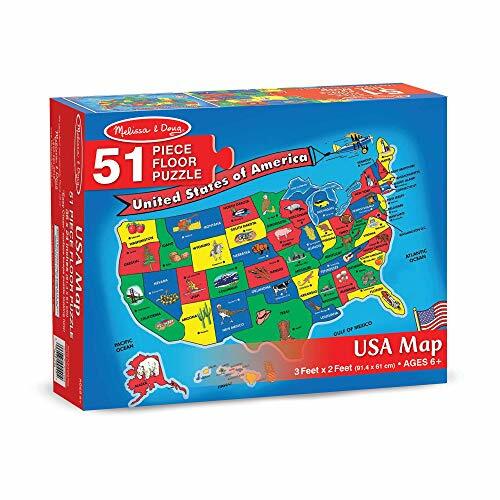 GREAT GIFT FOR KIDS 6 AND UP: This USA Map Floor Puzzle makes an ideal gift for kids ages 6 and up. Add the Dinosaur Floor Puzzle to round out the puzzle play experience and give kids another engaging option for screen-free fun. Geography comes to life with this cardboard floor puzzle, featuring 51 pieces cut to the shape of each state. Measuring 2” x 3” when assembled, the extra-thick pieces feature an easy-clean surface to keep them looking like new. Kids will have fun learning the states on this colorful, informative map puzzle. Map puzzles for kids are an exceptional way to teach children to have fun, learn the geography of the United States, and develop multiple cognitive, physical, and emotional skills. All 51 pieces of the Melissa & Doug USA Map Floor Puzzle have customized details, including the state name and capital, with most states including a primary industry or hallmark of the state—such as the Statue of Liberty for New York. 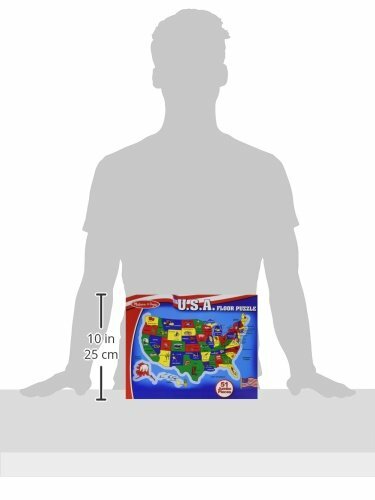 This USA Map Floor Puzzle makes a great gift for kids ages 6 and up. Add the Melissa & Doug Dinosaur Floor Puzzle to round out the puzzle play experience and give kids another engaging option for screen-free excitement. 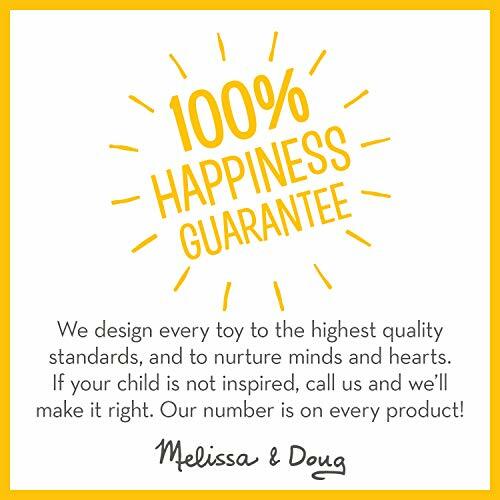 For over 30 years, Melissa & Doug has created beautifully designed imagination- and creativity-sparking products that NBC News calls “the gold standard in early childhood play.” We design every toy to the highest quality standards, and to nurture minds and hearts. If your child is not inspired, give us a call and we’ll make it right. Our phone number is on every product!